Physical therapy is an important part of the treatment for osteoporosis and our Therapist has specialized training in the treatment of osteoporosis. We will provide you with a thorough assessment of your physical abilities and limitations. Physical therapy for osteoporosis patients without a fracture includes strengthening exercises and resistance exercises intended to increase bone mass and make bone-supporting muscles stronger to help prevent fractures. To ease the stress on your bones, your physical therapist will also teach you about body balance, body mechanics and posture. Your therapist will also work with you to find out if there are any risks to you at home and at work such as specific activities that can lead to bone fracture. Physical therapy for osteoporosis patients suffering a fracture involves specific exercises and other treatment methods designed for pain relief and bone strengthening as well as prevention of fractures in the future. 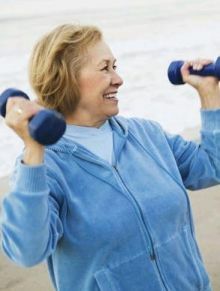 Physical therapy for osteoporosis seeks to strengthen bones, increase flexibility and manage pain. It also increases the patient's awareness of the body and develops responsibility for their own health.